KjPn 8 (PLN 112-0.1) is an unusually-shaped (14′ x 4′) planetary (PN) nebula located in the Constellation of Cassiopeia at RA 23h 24m 10s and DEC +60d 57m 30s. 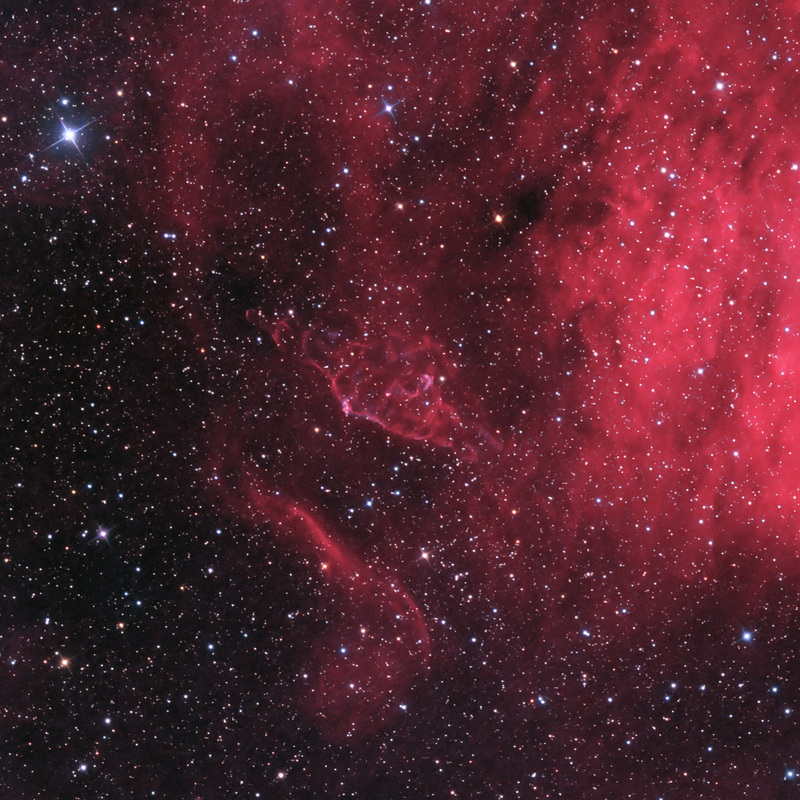 It is partially embedded in hydrogen nebulosity from the often-imaged Bubble Nebula complex (NGC 7635, Caldwell 11) and the open cluster, M52, located off the upper right side of this image. North is up and the field is ~ 35′ x 35′. Lopez et al. (Astrophys. J, v538, 233-240, 2000) describes KjPn 8 as an “extreme polypolar planetary nebula with a large scale structure characterized by a giant biconical envelope”. Steffen and Lopez (Astrophys. J. v508, 696-706, 1998) suggest that the strange tubular structure results from the action of a bipolar, rotating episodic jet whose direction has changed with time. The radial velocity measurements suggest a distance of ~5,200 light years. They suggest that it formed from two distinct and consecutive PN-like events starting with a binary core have stars of similar mass. One event led to the very long structure (NW-SE). The other (NE-SW) extends between the bright pinkish lobes that are enriched in OIII. They further suggest that KjPn 8 may be a rare object in the Milky Way Galaxy. The tiny 4″ core was imaged by the Hubble Space Telescope. This image is a composite of 3nm OIII and H-a emission line data (13 hrs) and 3 hours of RGB data and mapped to “natural color” where H-a is mapped to red/magenta and OIII to blue-green. The RGB data provided star color based upon the G2V white point.